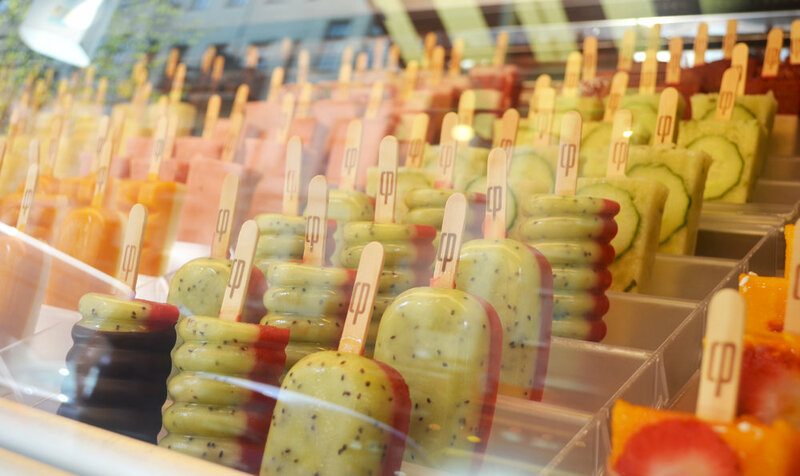 What screams more summer than having a popsicle? Don't be surprised to spend way too much time deciding on which ones to get since there are so many flavors and they all look tasty. From 1/2 strawberry 1/2 kiwi, watermelon, chocolate, to 1/2 mango 1/2 coconut and blueberry cheesecake, it'll always be delightful whichever flavor you choose at the end. We were fortunate to catch Tom, one of the founders of California Pops, right before he was about to hop back on his truck for a delivery, and get introduced to the colorful world of popsicles. The shop and the popsicles are so colorful. Could you tell us about how you came up with the concept for this shop? Actually I’m from Berlin, but I was away from around 1999 to 2014. I had lived in Australia and in Indonesia for 14 years surfing and working in textile design. I took a gap year and travelled to different countries around the world. I saw the concept of ice pops in California, Mexico and Columbia, plus we love the hand-painted signs there. 3 to 4 years ago, you can see a lot of graffitis in Berlin but not so many hand-painted signages, so we thought it would be exciting to bring the concept of ice pops along with hand-painted styles here. It seems pretty difficult to bring in the idea of ice pops all the way from another continent. What is the process like? The concept of popsicles can be really simple, and you can make some basic ones at home fairly easily. You could put some juice or yogurt into a container, put it in the freezer for about 4 to 5 hours and you would get a decent popsicle. On the other hand, we have the machine to freeze the ice creams very quickly to very low temperature, in order to get micro-crystallization. With micro-crystallization, the crystals in the popsicles get really small, which gives you the nice and consistent texture. We did a lot of experiments to reach the point where we produced satisfying products that we could sell. Opposed to staying in Indonesia and surfing, what made you decide to make and sell popsicles? I wanted to move back to Berlin, and making ice cream is great since you make people happy. We experiment a lot and improve our machinery very often, so we can keep raising the standards of quality popsicles and selling innovative products to our customers. What is the biggest challenge since you started this shop? The job requires long hours and a lot of hard work, and everyone who started their own business will tell you similar stories. You would think being a boss means driving around managing people and relaxing, but it is more than that. My day is consisting of making and selling ice cream, staff onboarding, managing staff work schedules, catering, delivering, and so on. It’s more than 12 hours of work everyday, from Monday to Sunday. However, you get customers telling you how much they love the popsicles, and that really keeps you going. The job is working long hours everyday, plus additional work in off-season, which you don’t even get paid for, and that’s the job we’ve chosen, and we’d stop it if it’s not enjoyable anymore, but so far we’re quite happy with what we’re doing. Are you currently working any new ideas or flavors at the moment? Recently, we just released pistachio and salted caramel. Pistachio is pretty special to me because I’m a big fan of pistachio. Though pistachio is probably the most expensive nuts, we still decided to do this flavor since people love it so much. Beside, we’ve just released the popcorn popsicles very recently. We tested it in the kitchen and we liked the result a lot, so we’re really looking forward to getting it out in the world.